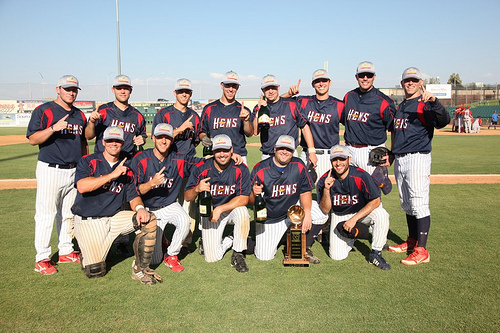 This was the second game of our championship triple-header at beautiful Jethawk Stadium in Lancaster. This championship matchup between the Mudhens and the top-seeded Lugnuts was set to be a battle between two of the top teams in the AA division. With that being said, let's get right to the action! The Mudhens fail to score in their opening at bat; sending the Lugnuts up in the bottom of the 1st inning to try and get on the board first. With 1 out in the inning, shortstop Andy Green singles to right. 3rd baseman Charlie Green, Andy's brother, follows him with a 2-run shot over the right field wall. The Lugnuts get 2 runs thanks to the brothers' Green; and they take the early lead. But the Mudhens get on the board in the top of the 2nd inning. 3rd baseman Vance Lynch singles to left center field. He steals 2nd and 3rd as 1st baseman Brent Schneider draws a walk and also steals a base. Shortly thereafter, a balk on the pitcher would score a run. A wild pitch would eventually score yet another. 2nd baseman Jeremy Basis contributes with an RBI single to center. The Mudhens would settle for 3 runs in the inning to take the lead in this championship; up 3-2 through an inning and a half. The Mudhens come up in the top of the 4th inning; still leading 3-2. They send up Vance Lynch who singled in his 1st at bat. He does so again with a single to start the rally. He soon steals 2nd base to give him 3 on the day and we're only in the 4th inning. Brent Schneider then reaches base due to a fielding error. Jeremy Basis is the next batter and he hits a sacrifice fly to right; scoring Lynch from 3rd. Next up is Jason Brown. He hits an RBI single; getting his 2nd hit of the day. The Mudhens add 2 runs to their lead, now up 5-2. The Lugnuts lead off the bottom of the 4th with right fielder Cole Van Buren. He singles to right field. Pitcher Josue Iniguez helps his cause with a single to left. 2 batters later, brother Joel Iniguez would single in a run. The Lugnuts would settle for the lone run in the inning; trailing by a score of 5-3 through 4 innings of play. But the Mudhens get that run back quick in the top of the 5th; and don't even need a hit to get it. Leadoff hitter Ryan Nunn reaches 2nd base on a fielding error, steals 2nd, and soon scores on a pass ball. They get the gift run in the inning to take a 6-3 lead through 4 1/2 innings of play. The score would remain 6-3 as the Mudhens came to bat in the top of the 8th inning. Catcher Kevin Burger led off the inning with a walk. He was followed by shortstop Shane Ampe who ripped an RBI triple into the gap. Vance Lynch, who was 3 for 3 on the day as he came to bat, kept the hits coming as he slaps an RBI single to make it 4 for 4 in this championship. 3 batters later, Jason Brown would get an RBI double; giving him 3 hits in this contest. With another run scoring on an error, the Mudhens end up with 4 big runs in the inning to take a commanding 10-3 lead through 7 1/2 innings of championship play. The Mudhens shut down the Lugnuts in order in the bottom of the 8th; sending them up to bat in the top of the 9th with things well in hand. This is where the wheels really came off for the Lugnuts. 5 Mudhens would draw walks in the inning. That, combined with 3 stolen bases and a pass ball, would result in 3 more runs for the Mudhens; giving them a huge 13-3 lead as the Lugnuts came to bat in the bottom of the 9th. The Lugnuts led off the 9th with Cole Van Buren who draws a walk. Josue Iniguez singles. 2 batters later, Joel Iniguez hits a 2-run triple, giving him 3 RBI's on the day. Another run would score on an error, but that would be it for the Lugnuts. They get 3 runs in the inning that prove to be too little too late; as the Mudhens romp in this championship. Congratulations to the 2012 AA-Division Summer Champion Mudhens! They win in convincing fashion and they put a big exclamation point on a great season!